The Social Security system provides a way for those who are of a certain age or disabled to receive monthly benefits after they have “insured” themselves through earning work credits by paying into Social Security throughout their working years. While the nature of the Social Security system should allow for those who have a severe disability to receive Social Security Disability Insurance (SSDI) and associated benefits, thousands of claims are denied every year. If your SSDI or SSI (Supplemental Security Income) claim has been denied, our Chicago disability benefits attorneys will advocate for you. Filing errors. If you made an error in filing, such as presenting inaccurate information or failing to provide requested information, your claim may be denied. High income. Regardless of whether or not you are applying for SSDI or SSI benefits, there is an income limit. If you make more money than the income threshold, your claim will be denied. Lack of severity of disability. In order to qualify for benefits, your disability must be “severe” and impede your ability to do the work that you once did. Disability not expected to last for 12 months or result in death. In order to qualify for SSDI/SSI benefits, your disability must have lasted, or be expected to last, for at least 12 months time or result in death. Your claim will be denied if your disability is thought to be less permanent than this requirement demands. You failed to follow prescribed treatment. If you did not follow treatment prescribed by your doctor, the SSA will deny your claim. If your SSDI/SSI claim is denied by the SSA, you have the right to appeal the SSA’s decision. You can request an appeal online – when you do so, you will need to provide evidence and documents that support your appeal and your right to benefits, such as medical evidence proving the expected length or extent of your disability. If your request for benefits is again denied, you can continue the appeals process by requesting a hearing before an Administrative Law Judge (ALJ). During the hearing, you will have the opportunity to present any new evidence and make a case for why the SSA should approve your claim. During this process, the help of an attorney can be imperative. When you are disabled, receiving SSDI/SSI benefits can change your life. An attorney can help you to file your claim to improve your chances of it being approved; if your claim has been denied, it is not too late – an experienced Chicago Social Security benefits attorneys will competently guide you through the appeals process. 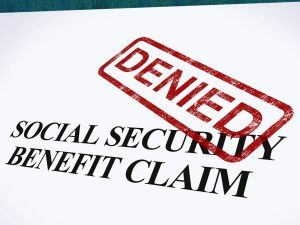 To learn more about denied Social Security benefits and what to do next, contact the legal team at The Comerford Law Office, LLC for a free consultation today. Reach us now at 312.863.8572.